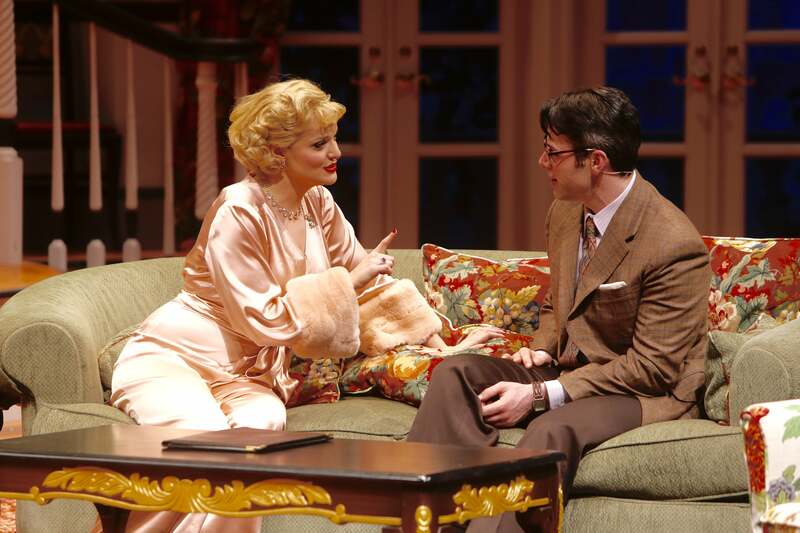 Paul Harris Online: Theater Review: "Born Yesterday"
Stepping into an iconic role is always risky. When the audience knows the original, there are bound to be comparisons. Judy Holliday became a star in 1946 with her powerhouse performance as Billie Dawn in Garson Kanin's "Born Yesterday." She reprised the role in the 1950 movie version, for which she won an Oscar, and woe unto any actress who has had to follow in her footsteps. The good news is that the actress who plays Billie in the St. Louis Rep's production of the play pulls it off. Her name is Ruth Pferdehirt (I joked to my wife that it's a stage name -- her real name is Debbie Pferdehirt), and she ably fills Holliday's shoes as the character evolves over the course of two hours. Billie is the girlfriend of Harry Brock, played by Andy Prosky, son of one of our favorite character actors of the last generation, Robert Prosky. Harry is a junk dealer who has built his business and become a self-made multi-millionaire, mostly by muscling aside the competition and steamrolling anyone and anything that gets in his way. Now he's in DC to bribe a senator and get legislation passed that will make it easier for him to continue amassing more wealth. Harry has brought Billie along, but he's worried she'll say or do something wrong, so he hires a local journalist, Paul Verral (Aaron Bartz), to give her a little bit of culture. That turns out to be a big mistake. As Billie wisens up about the ways of Washington, she also falls for Paul, and that can't be good for Harry. As played by Pferdehirt, Billie isn't stupid, she's ignorant -- she doesn't know what she doesn't know -- but she has a thirst for knowledge. Much of Pferdehirt's performance is lifted directly from Holliday's, including all the business during the classic gin rummy scene, when you can't take your eyes off her. Prosky is just as full of bluster as Broderick Crawford was in the movie, but Bartz isn't quite the stud that William Holden was as Verrall. Still, the cast is solid, the laughs come regularly, and "Born Yesterday" still resonates with its talk of corruption and the power of the rich to run our government at the expense of the people. By the way, if you haven't seen the 1950 movie, rent it and watch it with your daughter. I'm proud that mine enjoyed it so much she can quote from the script. For instance, when Harry yells, "Shut up! You ain't gonna be tellin' nobody nothin' pretty soon!" and Billie replies, just as loudly, "DOUBLE NEGATIVE!"